Some Magic players know Prereleases as events they've been going to for years, one of their favorite times around. 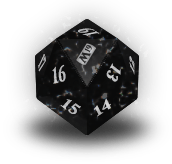 For many others, you may just be gearing up for your first ever Prerelease—laying the groundwork for the first chapter in your Prerelease story. Why? Because Prereleases are just some of the most fun you can have playing Magic! 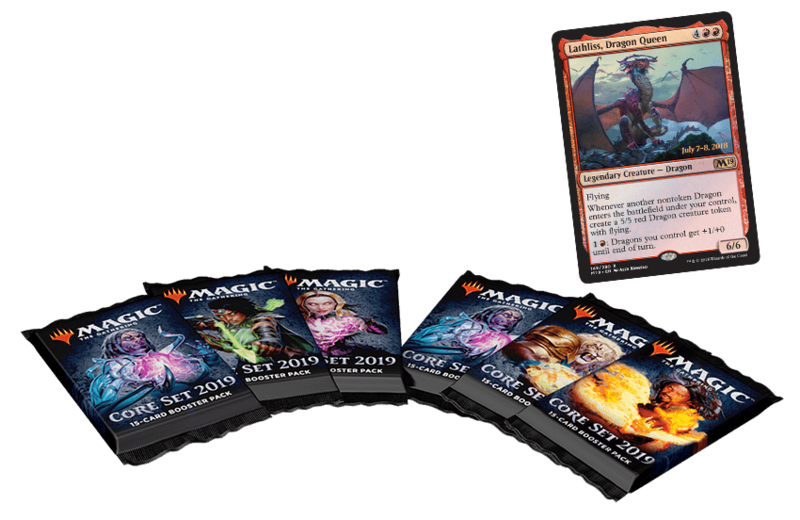 If you're a Sealed Deck veteran, you may want to skip ahead to the next section, where I talk about some of the differences you can expect at your local store for Core Set 2019. But if you're new to the wide world of Sealed Deck, or are maybe just looking for a few extra pointers, then read on! Be sure to pack all the supplies you will need during your adventure! For example, you may still want to bring a Standard deck to play for fun between rounds, a trade binder, pen and paper to keep track of life, and even a water bottle. Okay now, let's see. You have a store selected on your map, and you've filled your pack with everything you'll need. You've even read through the recent Magic Story, so you're up to date on what the deal with Nicol Bolas is. And, of course, you've taken a look at all the awesome cards in the Core Set 2019 Card Image Gallery. Perhaps, if you were curious what a tournament might be like, you might have checked out my article conveniently titled "Your First Tournament." That box is yours to keep! Store your Prerelease deck in it today, and then perhaps put another deck in there later. Oh, and that's not all! The first thing you're going to want to do is figure out a method to pick which colors you'll be playing. I recommend playing two colors. A good "mana curve" in that color—meaning lots of creatures of different costs. Now you have your colors down. From there, how do you take everything you have and figure out which 22 to 23 cards you're going to want to put in your deck? If you want to learn more about mana curves, you can also check out my article on how to build a mana curve. You can play more than 40 cards, but you really should stick to 40 if possible. Every card you play past 40 just means it's that much less likely you're going to draw that awesome rare you put in your deck. The land ratio you're looking at should be about 17 lands to 23 nonlands. This isn't right 100% of the time, but most Limited decks end up looking like this, and in general, it's what I would want to have. Play a mix of cheap-to-cast and expensive-to-cast cards. If you have all cheap, small creatures, then a single big creature can shut you down. If you have all large, expensive creatures, you risk getting run over first. Stick to a mix that focuses on the two-, three-, four-, and five-cost creatures. More games of Sealed Deck are won by casting a creature every turn starting on turn two or three than any other way. How does this kind of multiplayer play out? It's simple: all of your creatures and lands are separate, but you each share the same 30-point life total and take your turns simultaneously—plus you can block for each other too! To do the best you can, you'll need to work together to overcome the opposition. Curious to learn more about how 2HG works and some of the intricacies of play? Be sure to check out the page all about it by clicking here. If the idea of spending a day playing a tournament doesn't fit into how you prefer to play Magic, or if you have less time and just want to experience Core Set 2019 on your own, you can get involved in Open Dueling. Starting off with Dominaria, the previous Standard-legal set, and continuing on into Core Set 2019 is the ability to actually pick up a booster box at the Prerelease! 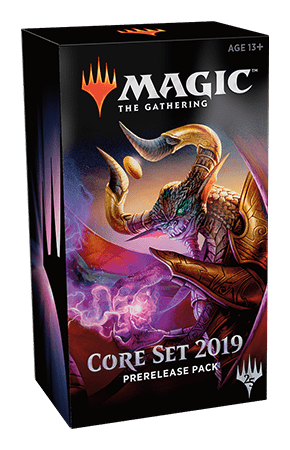 That's right: if you preorder a Core Set 2019 booster box ahead of time, you can actually buy your box and bring it home (or crack it all open there!) right away. Contact your local store for more details. Similarly, you can also buy Planeswalker Decks on Prerelease day as well. Open Dueling or not—feel free to pick up a deck and get to battling! While Core Set 2019 doesn't have any brand-new mechanics, it still has its fair share of unusual cards! 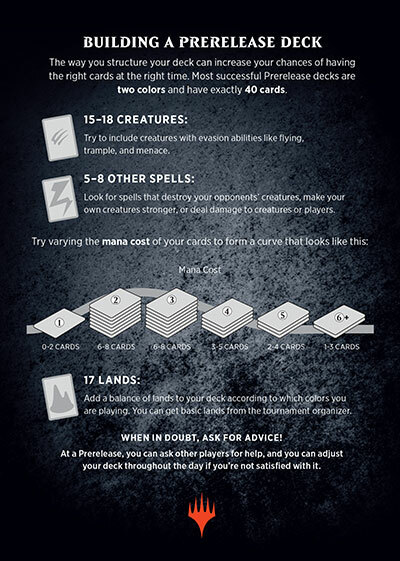 If you're curious how anything in the set works and want to dive deeper into it, be sure to check out the Release Notes here. It's been a few years since we've released a core set—and I'm so glad they're back! It's refreshing, fun, and there's no better time to start playing. Just watch out for Nicol Bolas! I hope you enjoy the set as much as we all have! From simple removal spells to the five Elder Dragons, I'm excited about how the set turned out. So, gather up your friends, take another look through the Card Image Gallery, make sure you're preregistered at your local store, and get ready to come out to the Prerelease and have fun! Have any thoughts or questions? Wondering what to expect? I'm happy to hear from you! Feel free to send them my way. You can always get in contact with me by sending me a tweet or asking a question on my Tumblr. I'll be around. May your Prerelease—whether for the first time or tenth—be wonderful. Have a marvelous one!